Neil Gaiman, originally uploaded by alister. 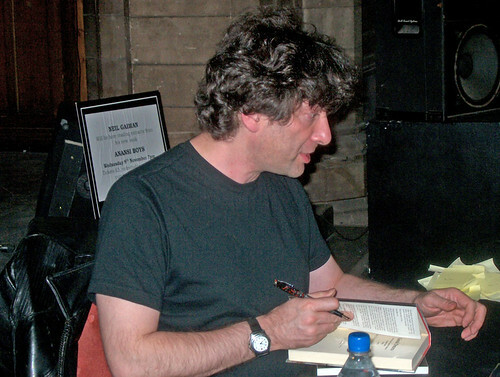 Neil Gaiman was in Edinburgh last night promoting his new book Anansi Boys. 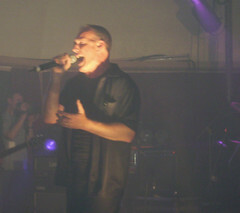 Gaiman came to prominence as the author of the acclaimed Vertigo series Sandman, the story of Morpheus the Dream King. It was a bit shocking when Neil revealed that Sandman is coming up for its 20th anniversary. Me = old. I had anticipated a big demand for tickets for the signing and sure enough the venue was moved from Waterstones to the Roxy - a nice old converted church down the Bridges, perfect for this kind of thing. You can sit at a table, order beer or tea and cake. Very civilised. It even has a wi-fi connection and I could see at least one person writing up their livejournal on their laptop (I did ask, but have forgotten the name of the site, if I can track it down I'll link it. UPDATE: Found it! ) The last event I attended there was a book launch by Gregor Gall, the attendance was a bit higher this time. It all kicked off with the Waterstones person laying down some rules about signing, which Gaiman immediately overturned and said not to bother about. Then on to a reading from Anansi Boys. The book seems to cover some familiar territory for Gaiman, the relationship between Gods, myth and everyday life and he chose a funny section to read which got lots of laughs. As did the Q and A which followed. Here is a quick resumé based on my notes. A: Miracleman is in legal hell. Todd McFarlane who claimed the rights when he bought Eclipse (although MM was creator owned and not owned by Eclipse) was taken to court and all was going well until he went bankrupt slowing the whole process down enormously. Gaiman noted that "Todd McFarlane loses court cases like others lose biros". Q: Why do you write about Gods and stuff? A: If John Grisham, Stephen King and himself were stranded in a house in the middle of a lake, Grisham would write about lying low to escape a legal rap, King would write about the creature in the lake and Gaiman would write about the house sprouting legs and walking away. As a kid his favourite book was "tales of the norsemen" and he saved up his pocket money for "tales of egyptian gods". Q: What is he working on now? A: A really dark childrens book called "The Graveyard Book"
A: Dunno, the DVD will be out soon. Q: Did he intend to return to the sort of themes of old stories used in Sandman: Dreamhunters? A: Those weren't really old stories, the page of references used at the back were all made up. The small typeface used made it convincing. He still gets letters from librarians who have been asked for the stories referenced. He is very sorry. Q: Any plans for future Sandman work? A: Coming up to the 20th Anniversary likely to do a 6 episode Sandman series, Sandman Zero, looking at what the Dream King was up to before the Sandman series began. There is also a possibility of doing Good Omens II with Terry Pratchett. Q: Given the political comment in his blog, has he been tempted to write more political work? A: He was annoyed at being dismissed as apolitical in the past. That changed when the Iraq war started and people began to look back at some of his work in a new way, specifically Sandman issue 50, Baghdad, which looked at the city through the ages and was the only modern work by a Western writer that journalists could find that did so. He doesn't like to be didactic and lecture but the personal is political and politics is unavoidable. Politicians are all untrustworthy and anyone who wants to be a politician should be disqualified. MP's should be appointed like juries, compulsory service by ordinary people. Q: What happened to the plans to write Dr Who? A: Would still like to do it and has some ideas. And apart from a very long queue to get my book signed, that was it. A cool evening. That was a fun night. Good write-up. My girlfriend was the one who asked the question about Dreamhunters, she asked me to say hello. He is from my hometown, Minneapolis. Thanks folks. Yeah, it was a good night. Hope something similar happens in Edinburgh soon.